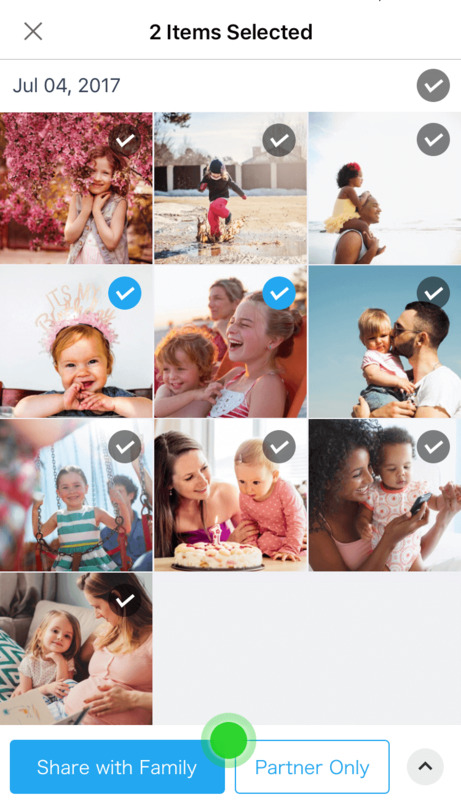 FamilyAlbum (formerly known as 'Family Album Mitene') allows you to easily share as many photos and videos of your children as you want with just your family members, all totally free of charge. Comment on photos, share your thoughts, and watch your children grow as the app automatically organizes uploaded media into monthly albums. You can even see who's been checking in! The app is totally free to use, so why not get started right away? You can start uploading by going to the Add tab. With FamilyAlbum Premium, you'll also gain the option to upload from your computer. (We recommend the latest version of Google Chrome.) To allow grandparents and other relatives to upload, a parent should go to the Settings tab and turn on the Allow Members to Upload option. *Grandparents and other relatives have the following restrictions when uploading from the app. ・They can't upload photos and videos at the same time. ・They can only upload up to twenty photos or one video at a time. If they plan to upload more, they must upload their media in multiple batches. 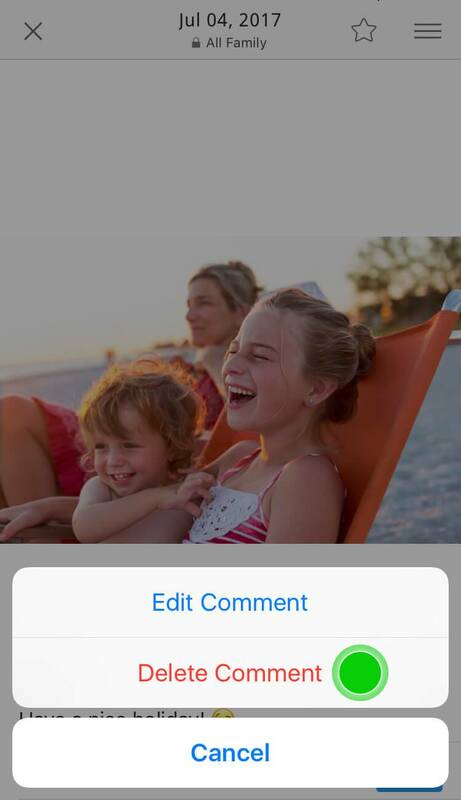 After selecting "Add," you'll be taken to the selection screen where you can choose what photos and videos to upload. What restrictions are there on uploading photos and videos? Also, is there a limit to the amount of photos and videos I can upload? You can upload any media in your smartphone's Camera Roll, All Photos, or Gallery. There's no limit to the amount you can upload. However, videos can be no longer than three minutes. 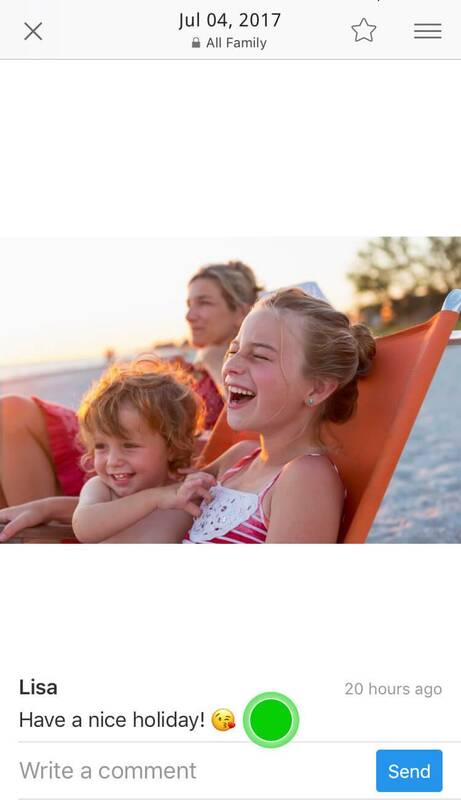 With FamilyAlbum Premium, you can upload videos up to ten minutes long. Can I upload photos from my computer or browser? 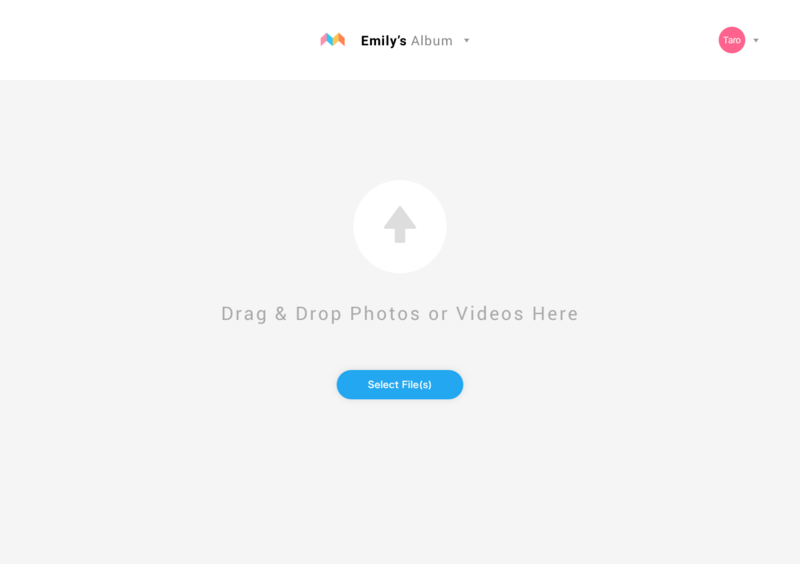 With FamilyAlbum Premium, you'll also gain the option to upload from your computer. *We recommend the latest version of Google Chrome. For more info, please check the link below. Can I upload photos from anywhere besides my Gallery or Camera Roll? 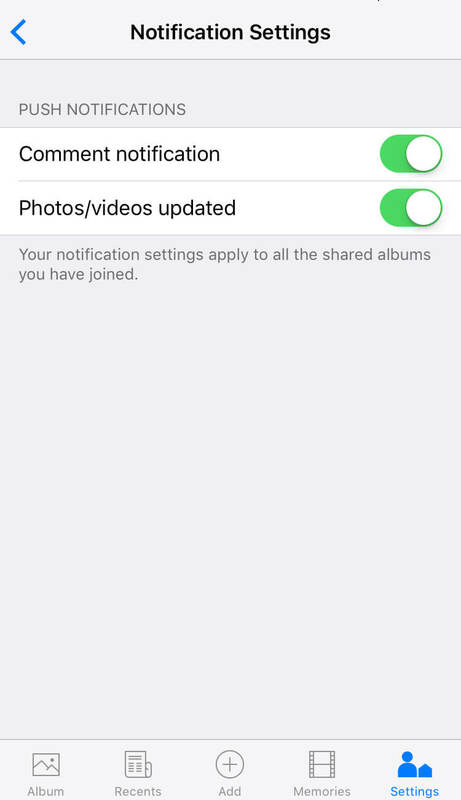 Currently, you can only upload media in your smartphone's Camera Roll, All Photos, or Gallery. In the future, we're aiming to expand this feature to allow more options. Can grandparents and other relatives upload photos and videos? To allow grandparents and other relatives to upload, a parent should go to the Settings tab and turn on the Allow Members to Upload option. What do the "Share with Family" and "Partner Only" options mean when I upload something? 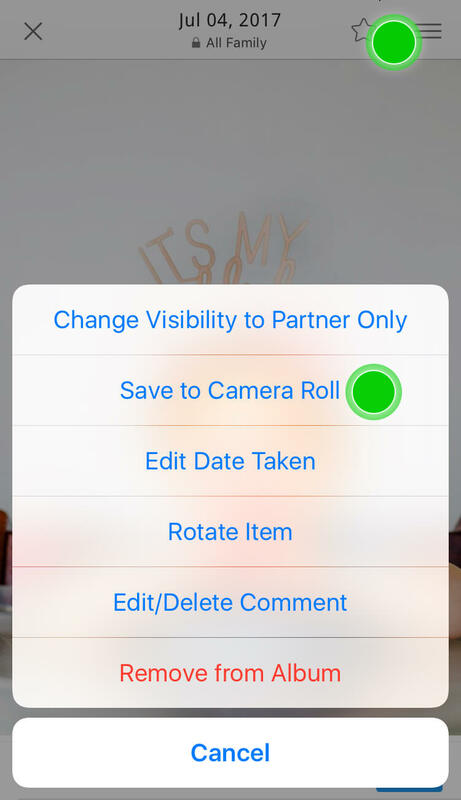 "Partner Only" means that only the child's parents are able to view the upload, whereas "Share with Family" allows the parents and all invited family members to view it. Family members you invite at a later date will also be able to view it. Each photo's visibility is displayed in the center above the image. You can change visibility settings by going to the top right menu of any individual photo. How can I stop receiving push and email notifications whenever a photo is uploaded? 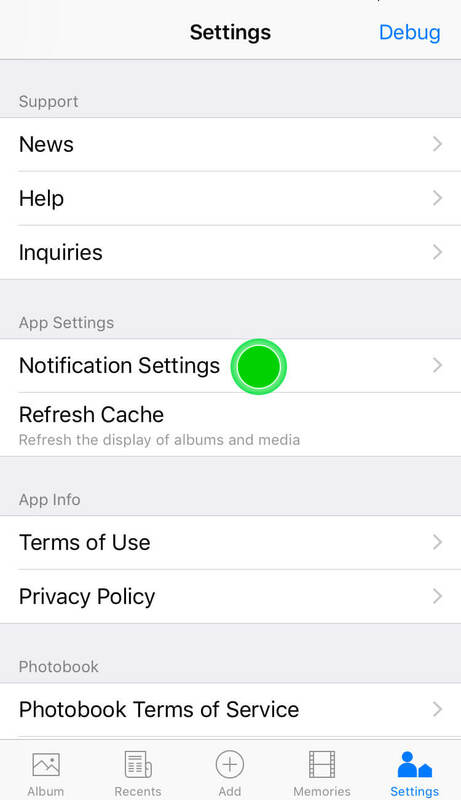 Turn off notifications via "Notification Settings" in the Settings tab. Turn off notifications via "Settings" at the top of the page. I'm experiencing problems when I try to upload a photo or video, such as my upload stopping. When uploading, please ensure that you have a strong and stable Internet connection. Restarting the app or your smartphone will reset the upload process and take extra time. If you would like to forcibly stop an upload, tap the Cancel button that appears on the album screen during the upload. If the problem persists, please go to the Settings tab and then select "Inquiries" to get in touch. We'll do our best to respond as soon as possible. Is it possible to make all Partner Only photos visible to my entire family in one go? Visibility settings for all media can be changed from "Change All Visibility" under the Settings tab. 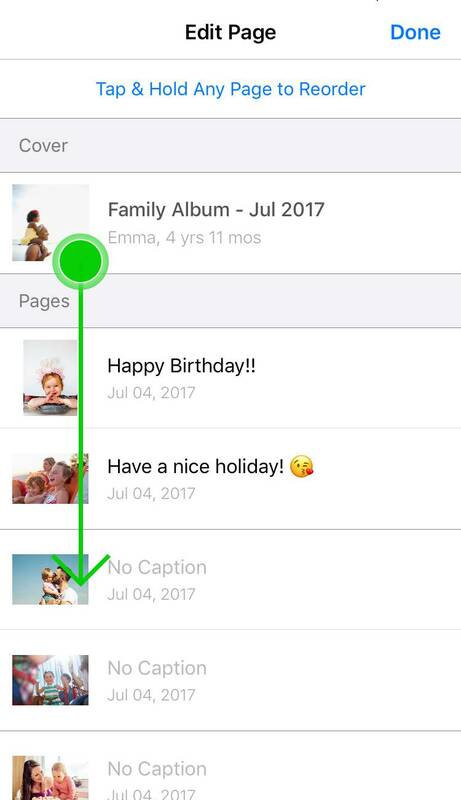 Can I separate photos into other categories, such as to share with step-parents only? Currently, you can only select either "Share with Family" or "Partner Only." We are looking to offer more options in the future. Can I create a separate album for each of my children? Currently, parents can only have one album. We hope to eventually make it possible to automatically or manually add tags for children and events. This would allow you to separate your photos. The uploading symbol in the top-right corner of a photo/video won't go away, so I can't delete or make change to the photo/video. What should I do? Make sure you have a strong Internet connection, then go to the Settings tab and select "Refresh Cache" from "Cache Settings." Then go to the Add tab and try uploading again. After I save a photo from an album I've joined as a relative, I can't add it to my own album because the photo doesn't appear. What should I do? We're very sorry you're experiencing trouble. Unfortunately, this issue happens from time to time under certain circumstances. We hope to resolve this problem in the near future and thank you kindly for your patience while we work on fixing it. How are the album pages ordered? All uploaded media is automatically sorted by month and displayed in chronological order. 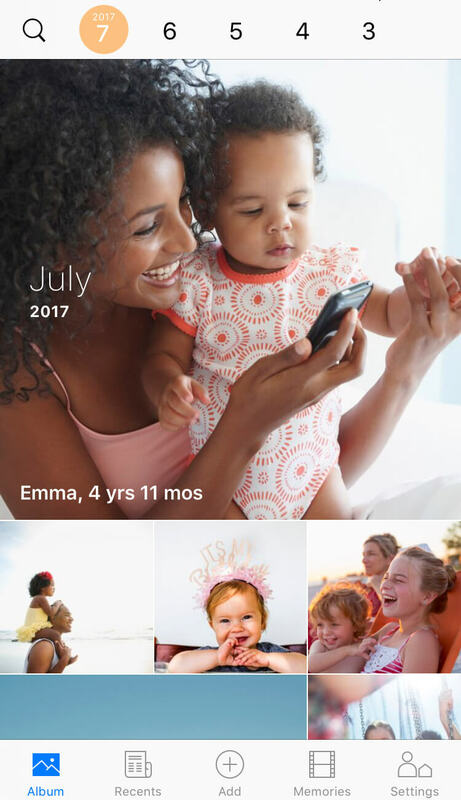 If you have photos spanning across two months or longer, simply swipe your finger left or right across the photos in the middle of the screen to change to a different month. View older photos of your children with ease. Why are some of the photos in my album bigger than others? The album is ordered according to the date and time the photos and videos were taken, and the photos' sizes correspond to that order. We're currently planning to increase the size of favorited and popular photos, too. How do I delete photos I've uploaded by accident? You can delete media by opening the top right menu of any photo or video. Grandparents and other relatives can only delete photos and videos they've uploaded themselves. Currently, photos or videos can't be deleted through the browser version of FamilyAlbum. If you have a photo or video you would like to delete, please use the app version. How do I change the orientation of photos I've uploaded? 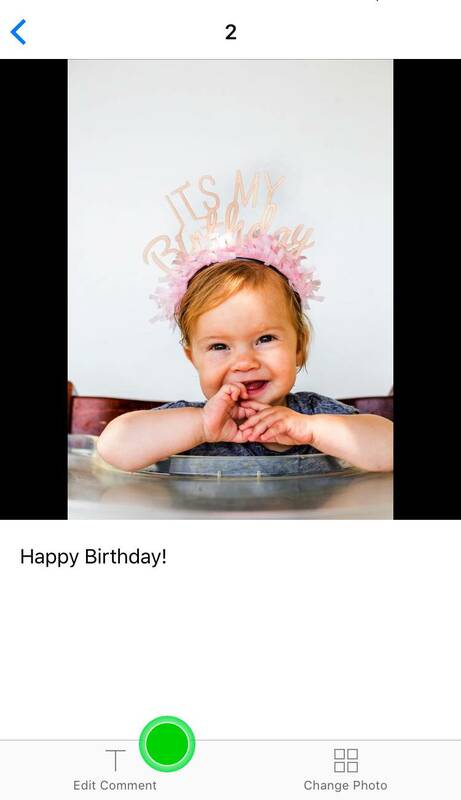 You can rotate photos from the top right menu of any individual photo. Grandparents and other relatives can only rotate photos they've uploaded themselves. How do I save photos and videos from the album page? Save media from the top right menu of any individual photo or video. Can grandparents and other relatives save photos and videos, and delete comments? Yes, they can do all these things. Save via the top right menu of any individal photo or video. Use the Save button located near each photo or video. Go to their own comment on the photo, then tap and hold on it to edit or delete. Press the X button next to their comment to delete. 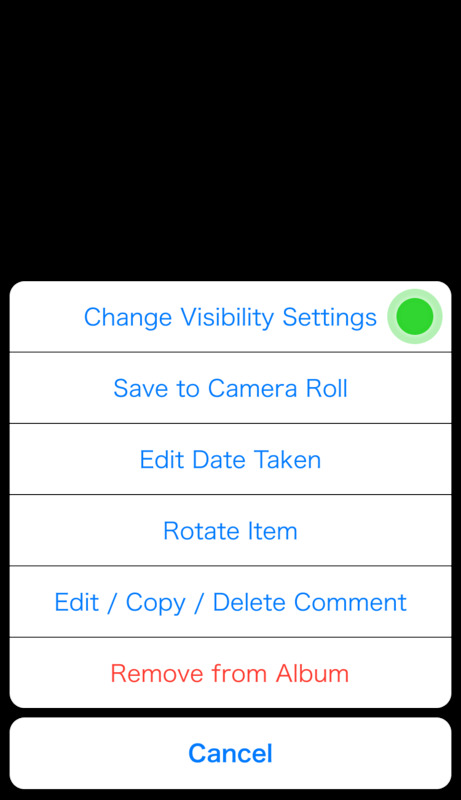 If you wish to change the visibility settings of all the photos and videos that have been uploaded, you can do it from "Change All Visibillity" option under the Settings tab. How do I save or delete multiple photos in one go? Unfortunately, that's not possible at this time. In future, we're hoping to introduce a feature that allows this. Until then, please bear with us. How do I view videos in landscape? To view videos in landscape, your iPhone or iPad needs to be running iOS 9.0 or higher. Please update your device accordingly. Why can't I play any videos? Try downloading and using Google Chrome to access FamilyAlbum. If you're still unable to play videos, please go to the Settings tab and select "Inquiries" to get in touch." What does the speech bubble icon mean on the album page? The speech bubble icon indicates the photo has been commented on. As one of the parents, how do I view photos and videos using a browser on a computer? At present, parents can only use the app version. However, you could always try inviting yourself to use the browser version as a relative. You'll then be able to view any photos and videos that are visible to all family members. We hope to allow parents to use the browser version in future. How do I set my browser so I can view photos by month? We're hoping to update the browser version soon so that you'll be able to do that. We're working on making this possible. Go to the Memories tab and select "Create" under Photobook to print a physical photobook. Photobooks are currently only available in Japan. We are working on shipping overseas in the near future. Contact us by going to the Settings tab, then selecting "Inquiries". We'll try to respond as quickly as possible. Why haven't I received a verification email after registering an email address? Please make sure your email settings allow you to receive emails from unspecified domains and senders. 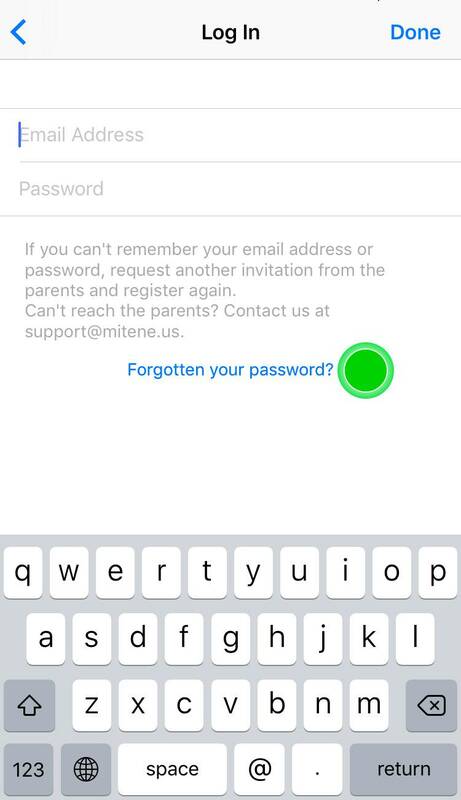 If you're using restricted email settings, set them so that you can receive emails from the "mitene.us" and "family-album.com" domain. If this still doesn't solve the problem, it may be that your email server isn't compatible with ours. In such cases, please go to the Settings tabs and tap "Inquiries" to get in touch. I registered an email address, but I forgot my password. What should I do? To reset your password, go to the Settings tab in the app, tap "Change Password," then select "Forgotten your password?". If you haven't logged in yet, tap "Already a Member? Login Here" then select "Forgotten your password?". I'm planning on changing my smartphone. Will I still be able to log in to my FamilyAlbum account? Before you change your phone, you need to register your email address (go to the Settings tab and select "Email Not Registered") to be able to use FamilyAlbum on your new smartphone. We highly recommend you register your email address as soon as possible. I changed/broke/lost my smartphone, or have deleted the app by mistake. Can I still log in to my FamilyAlbum account? 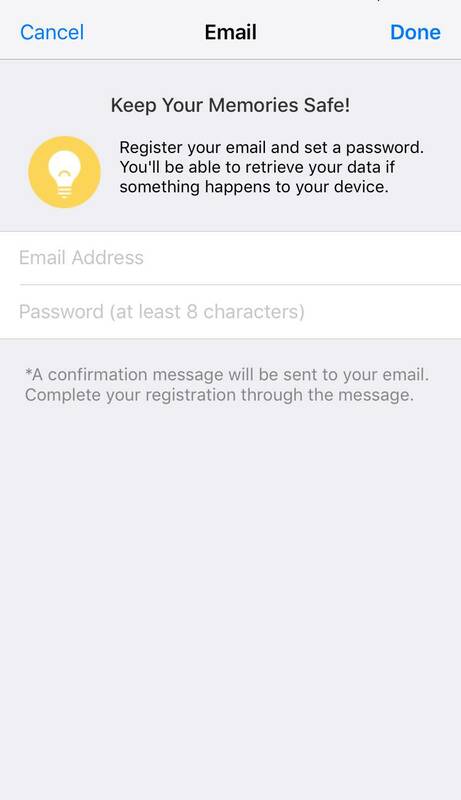 You need to have registered your email address (go to the settings tab and select "Email Not Registered") before any of these things happened. You can then use that email address to log in to your FamilyAlbum account. If you didn't register your email address, but your partner uses FamilyAlbum, just get them to send you an invitation so you can register again. If your partner doesn't use FamilyAlbum, contact us at support@family-album.com , and we'll do our best to help you recover your account. My child's grandparent/relative changed their phone or has done something so they can't log in. What should they do? If they've registered an email address, they can use it to log in. If not, they need to be invited again by a parent. They'll be able to register a new account from the invitation email they receive. Ever since I changed iPhones, the app crashes when I boot it up or it gives me a connection error. What's going on? This sometimes occurs when migrating from iCloud Backup or an unencrypted backup service. If you registered an email address, you can reinstall the app, and then log in using your account details. If you haven't registered an email address, you need to reinstall the app, and then have a parent invite you again. If your partner doesn't use FamilyAlbum, contact us at support@family-album.com , and we'll do our best to help you recover your account. The app stops updating or downloading before it's finished. What's going on? This seems to happen with some smartphones. Try resetting your smartphone, then start updating or downloading the app over a strong Internet connection. 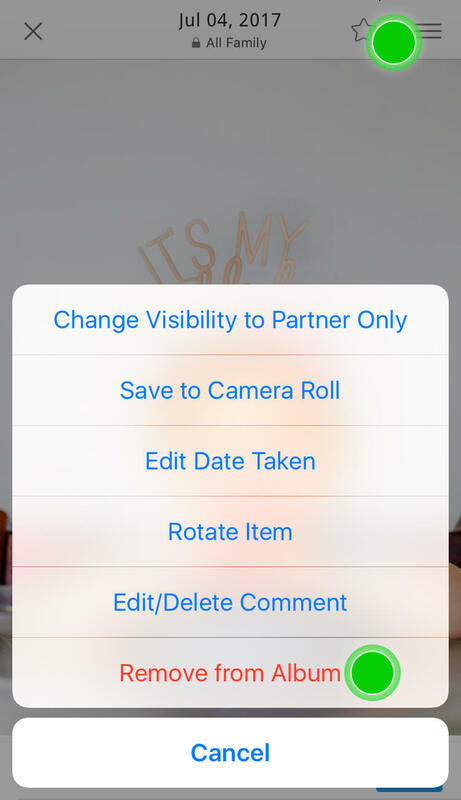 How can I use this app with my partner? 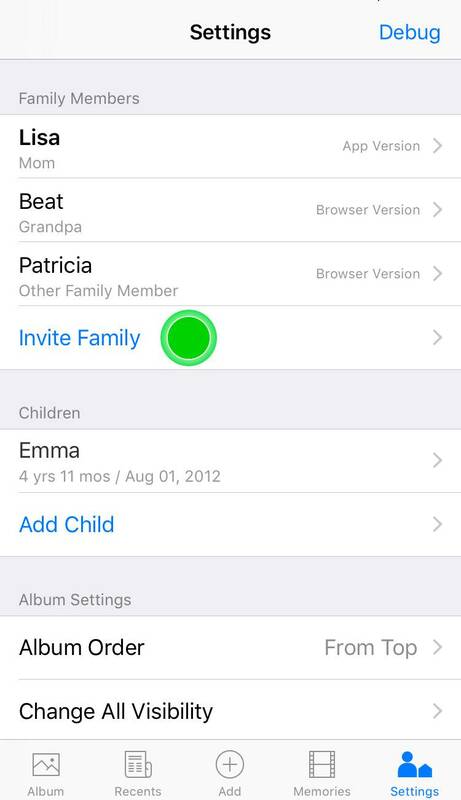 Go to the Settings tab and tap on "Invite Family." Only parents can send invites. You can send invites via email, SMS or LINE. My partner and I began using the app separately. How can we start using the app together? One of you needs to delete their app. Whoever still has the app on their phone should then invite the other person. The one receiving the invitation should install the app via step 1, and then tap the URL in step 2. If you follow these steps correctly, you'll be able to use the app together. How can I share photos with grandparents and other relatives? Can the app be used on computers and tablets? 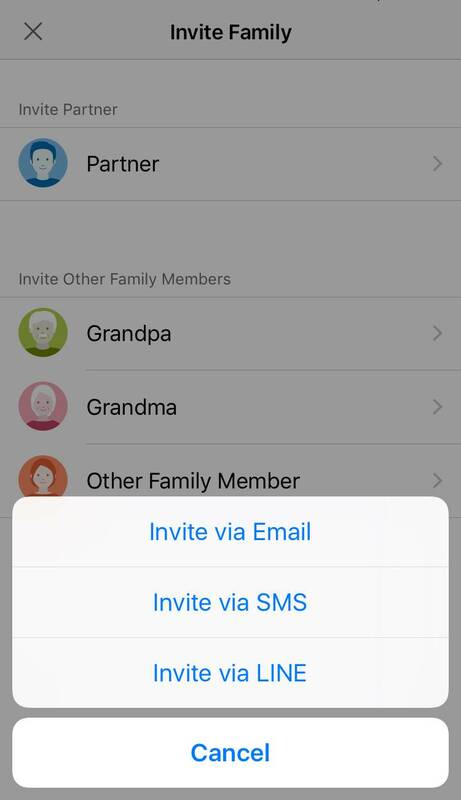 To invite someone, go to the Settings tab and tap on "Invite Family." You can use the app version on smartphones and tablets, and the browser version on computers, smartphones, and tablets. 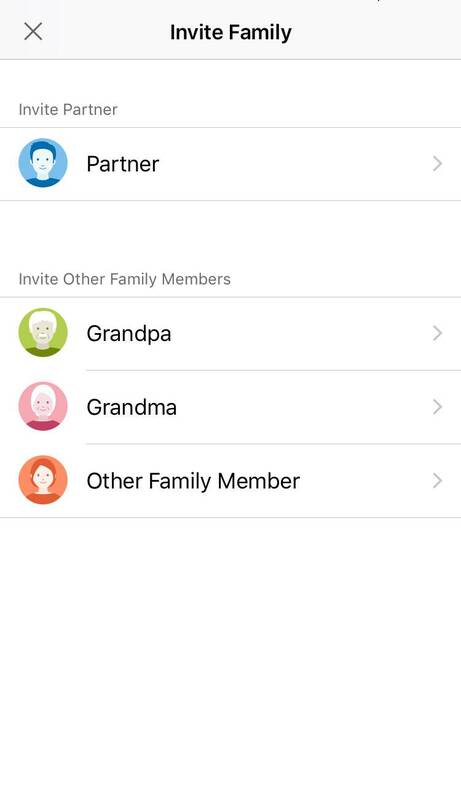 What does "Invite to App Version" mean when inviting grandparents and other relatives? You should select this if you want grandparents and other relatives to use the app version on their smartphone or tablet. Sending this invitation allows them to install and use the app. You can send invitations via email, SMS or LINE. There are advantages to using the app version, such as being able to view albums by month, and being able to zoom in on photos more easily. Are there any reasons why grandparents and other relatives may not be able to use the app? 1) Their device could be using an old version of its OS. The app will only work on iPhones running iOS 8.0 and higher, and Android phones running version 4.1 and higher. Also, some smartphones may not be compatible. Please check the version of their device's OS. Alternatively, they can use the browser version. That should solve most problems. 2) A maximum of 30 people (including you) can join from one family. Any more than that and you won't be able to send invitations. 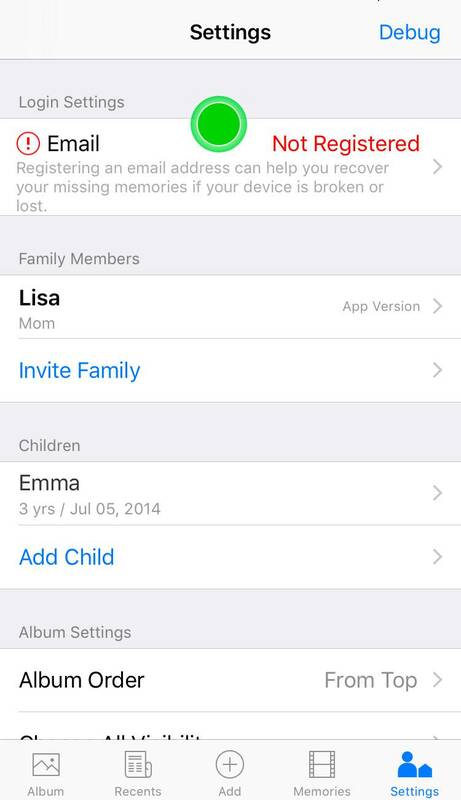 To make room, you can delete people's accounts by going to "Family Members" in the Settings tab. What does "Invite to Browser Version" mean when inviting grandparents and other relatives? You should select this if you want grandparents and other relatives to use FamilyAlbum via a browser on their computer, smartphone, or tablet. They will be sent an email containing a link to the album. They just need to open the link to start viewing. We recommend this version for family members who are unfamiliar with installing apps, or simply prefer to use a computer. My child's grandparents or other relatives are using the browser version, but I'd like them to switch to the app version. What should I do? 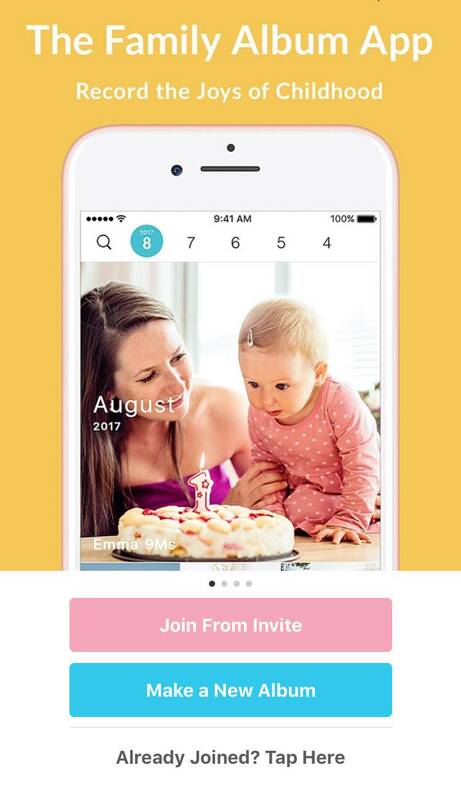 You will need to send a new invitation to the family member and have them create a new account for the app version. 1. Select "Invite Family" from the Settings tab, then tap on the family member you want. 2. Tap on "Invite to App Version" at the top of the page. You can choose to send the invitation via email, SMS, LINE, or Facebook Messenger. 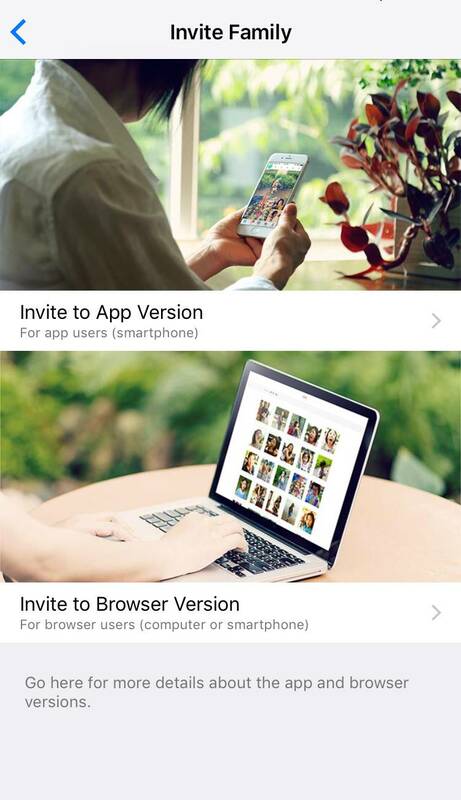 After the family member has received the invitation and created an account for the app version, they will have two accounts: one for the browser version and one for the app version. *If they no longer wish to use the browser version account, you can delete their account by tapping on their name and selecting "Delete Account" from the bottom of the page. The links you shared with them will no longer work, and they will no longer be sent notifications via email. Please note that only parents can perform the actions above. Can grandparents and other relatives invite other family members? No. Only the parents can invite other family members. Additionally, only the parents can delete photos and videos, change the visibility settings, and change the day a photo was taken. Some of my family members use iPads and other tablets. Can I still invite them? Yes. Just send them an invitation in the usual way. They can install the app via the link in their invitation. Can I delete the accounts of family members I've invited? To find the person whose account you want to delete, refer to their last login time or nickname via the family list in the Settings tab. Once you've found them, tap on their name. You can then remove their account via the "Kick from Album" or "Delete Account" options that appear at the bottom of the page. Don't worry, though. Even after removing people from an album, the photos and videos they uploaded, as well as their comments, will remain visible. Can I join multiple family albums from the app? Yes, you can. 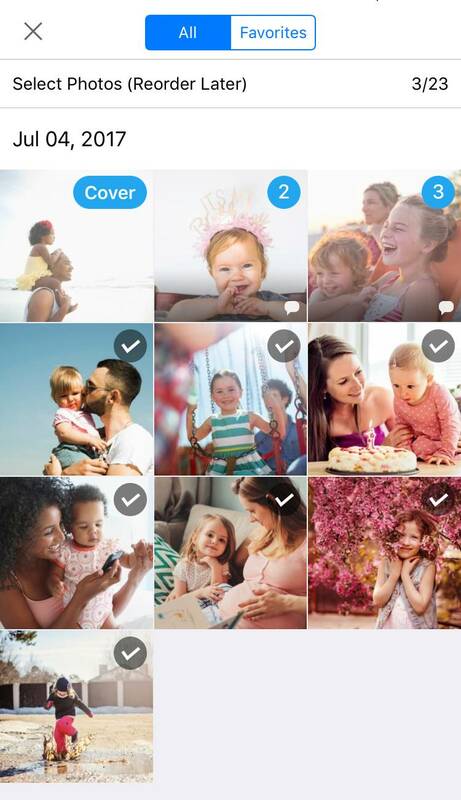 For example, a grandmother can join albums for both her son's and daughter's families (provided she has invitations from both sets of parents), and a couple who've seen their niece's album can go on and create an album for their own children (by selecting the "Create Own Family Album" option in the Settings tab.) Please bear in mind that you can only create one album for your own children. Also, you can only join up to six albums. Where do I go to switch between family albums? Go to the Settings tab and tap on "Albums" to switch between albums. If the app icon is showing that you have unread notifications that don't go away even when you tap on Recents, it could be that these notifications are for a different album from the one you're currently viewing. Try switching albums from the Settings tab. Why aren't email notifications about new comments and photos being sent to family members who use the browser version? Make sure those family members' email settings allow them to receive emails from unspecified domains and senders, as well as emails containing links. 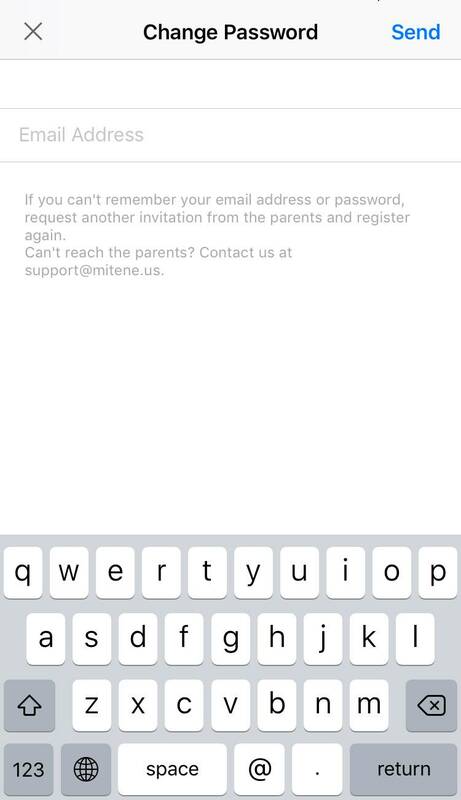 If they're using restricted email settings, ask them to make sure their email accounts are set to receive emails from the "mitene.us" and "family-album.com" domain and those containing links. What is the Visits section? This allows you to check whether your family members have been logging in to FamilyAlbum. When you tap on the Recents tab, the family members who use FamilyAlbum will be displayed at the top of the screen. The times displayed below the family members show when they last logged into FamilyAlbum. What do the letters displayed in the Visits section mean? These are the first three letters of your family members' nicknames. For example, if someone chose the nickname "Hank," the letters "Han" will be displayed. Why does the same person appear more than once in Visits? Why does my own name appear? This could be because you've sent multiple invitations and multiple accounts have been created as a result. By checking the nicknames and login times displayed in the Settings tab, you can identify which accounts are no longer in use. 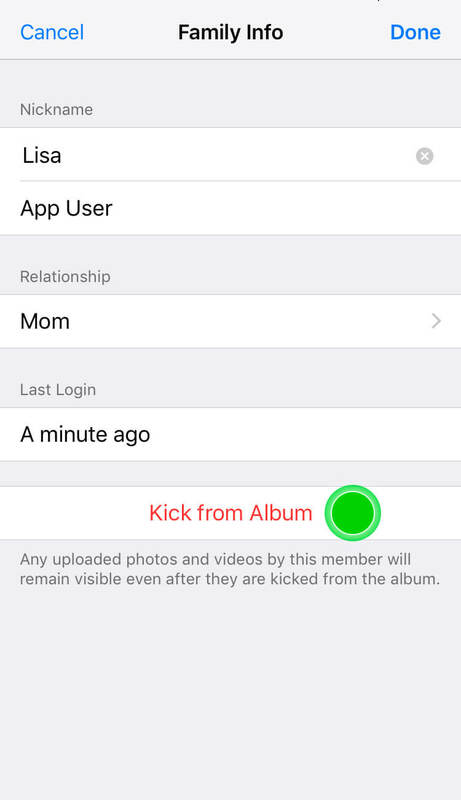 Just tap "Kick from Album" to delete them. Rest assured that even after removing people from an album, the photos and videos they uploaded, as well as their comments, will remain visible. Why am I not displayed in the Visits section? This is because if you were displayed in your own Visits section, your last login time would always show up as "Just now." But don't worry. You'll still show up in your family members' Visits sections. How do I delete my own comments? Tap and hold on a comment and you'll have the option to delete it. How can I stop receiving push and email notifications for comments? 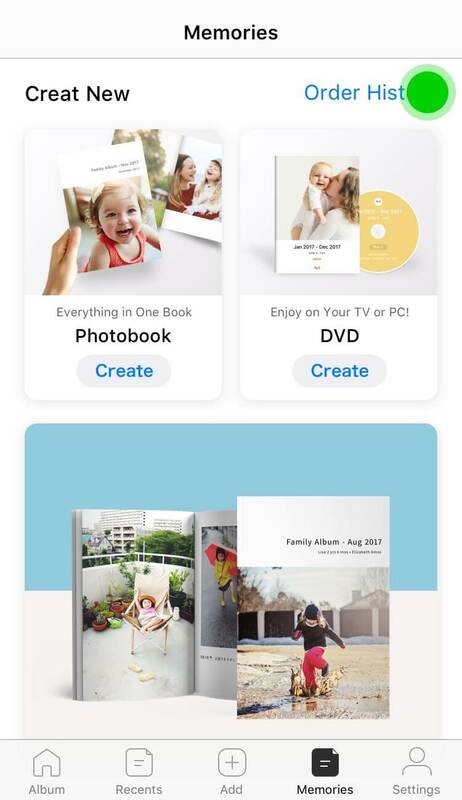 What are the Photobooks available from FamilyAlbum? 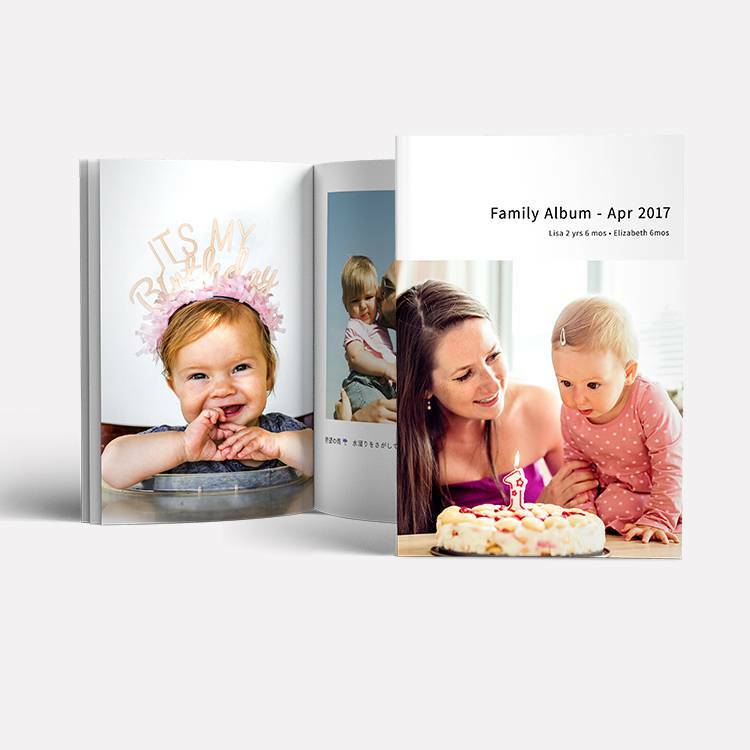 With FamilyAlbum's Photobooks, you can turn your family memories into stylish and beautiful photo booklets at any time, quickly and easily. Our Photobooks are compact at an A5 portrait size (approximately half letter size), and cost $7.49 USD each (plus tax). Photobooks full of memories from the previous month are compiled automatically for you, and you can purchase them with a single touch. Or if you prefer, you're free to edit these Photobooks so they're just to your liking, or even create them from scratch. 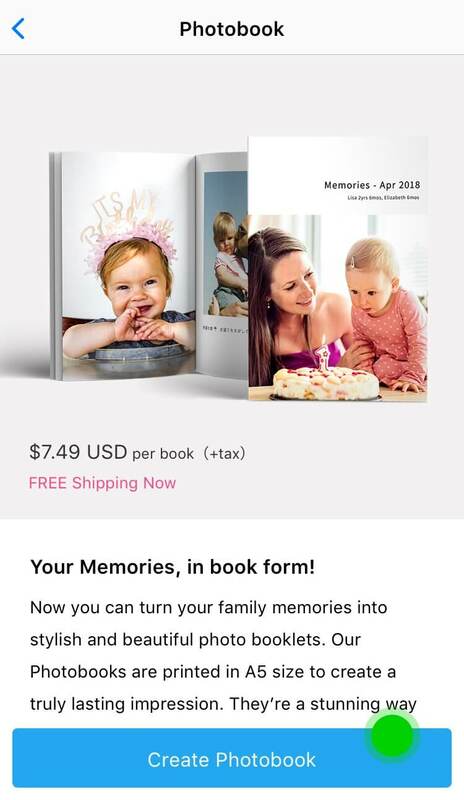 For more information, tap the "Photobook" menu in the Memories tab. How much do Photobooks cost, and do you have any more detailed information? Our Photobooks are compact at an A5 portrait size (approximately half letter size), and cost $7.49 USD each (plus tax). For more information, tap the "Photobook" menu in the Memories tab. There you'll find more details about the specifications of our Photobooks. If you wish to pay in Japanese Yen, please switch your language setting to Japanese. How do you select which photos go into the automatically created Photobooks? Photobooks will be automatically created when 23 or more photos taken in the previous month are uploaded. 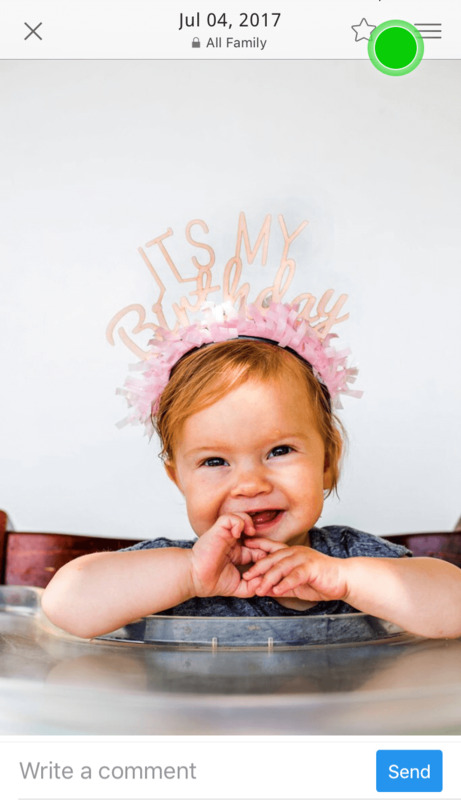 The photos are selected according to certain rules, which include date and time taken, visibility settings, facial expressions, and number of comments. Can I edit Photobooks and make my own from scratch? Of course. 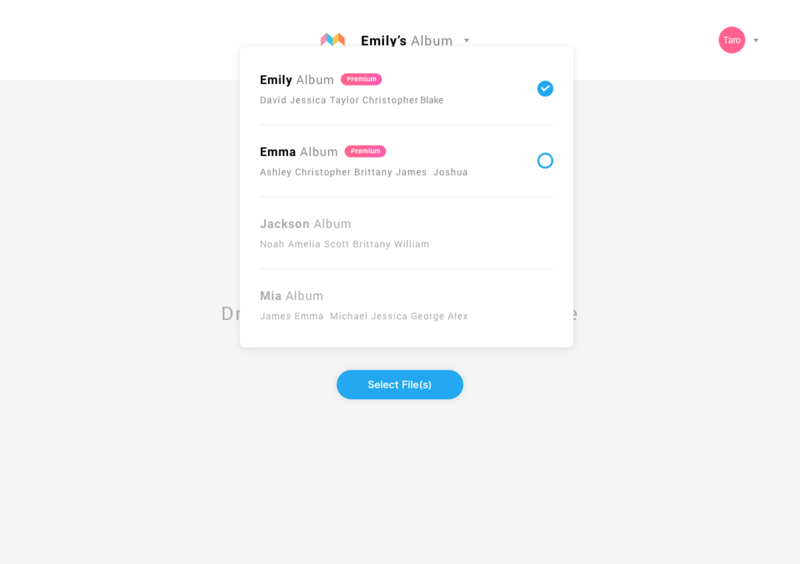 You can take the automatically generated Photobooks as a starting point and swap in your favorite photos or switch their order, change titles, and add or edit comments. You can even create Photobooks entirely from scratch. To create your own, tap the Memories tab, then select the "Create" in the Photobook menu. Are the Photobooks I make myself, automatically created Photobooks, or my ordering information shared with other family members? No, they are not. Only you can view your Photobooks and ordering information. Can I make a Photobook even with only a few photos? 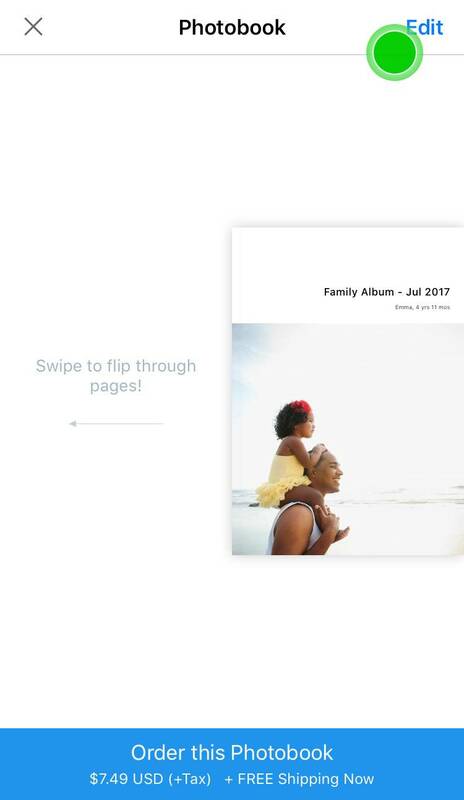 FamilyAlbum Photobooks consist of one cover photo and 22 photos inside. Currently, it's not possible to create Photobooks with blank pages or only writing. You need to have at least 23 photos uploaded to create a Photobook. When I go to the Photobook preview screen, the edges of the photos have been trimmed. Will the printed versions be trimmed too? Yes. The printed versions of photos will be trimmed if that's how they appear in the Photobook preview page. Will the photos in the actual Photobook and those on the Photobook preview screen differ in any way? There may be some slight differences that arise during printing. Comments may be affected due to the number of characters that can fit on a line. Rarely used emojis, emoticons, or certain non-alphanumeric characters may not display properly as well. The position of photos may also shift slightly during the printing process. Please take the above into account before placing your order. Why do vertically long full-screen photos stop being full-screen when a comment is added? This is in order to create space beneath the photo to display the comment, but to do this we have to crop the photo a little. How long can a comment be? Comments can be up to 200 characters long. 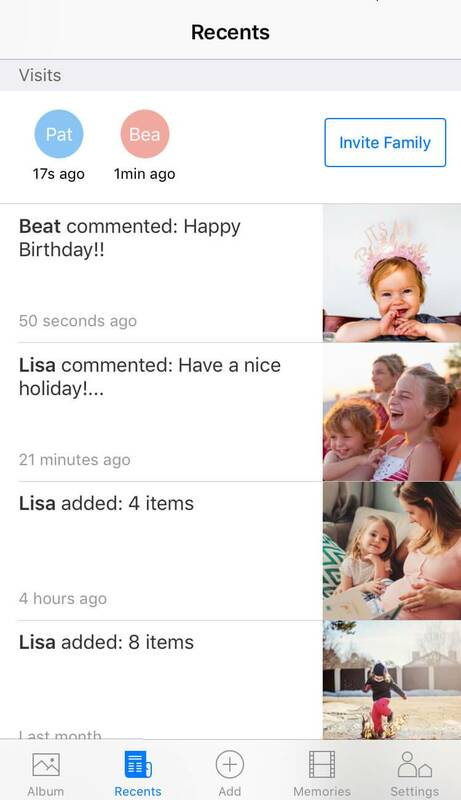 If your photos have received comments on FamilyAlbum, the first comment will be the one displayed in a Photobook. Of course, you can change or delete comments that have been automatically added. Can I enter any type of character, emoji, or emoticon? While we try to cater for as many symbols as possible, less common ones may not display properly or even at all. If you encounter such problems with a Photobook, go to the Memories tab and tap on "Order History" from the menu. Then select the order in question and tap on "Inquiries" at the bottom. If possible, please attach a photograph of the problem with your inquiry. We'll send you a free replacement copy of your Photobook. Please also be aware that custom emoji that exceed the boundaries of regular text will likely not display properly. We ask for your understanding on this matter. Can I sort and rearrange the pages in my Photobook? Yes. Just go to "Edit" in the top right of the Photobook preview screen. 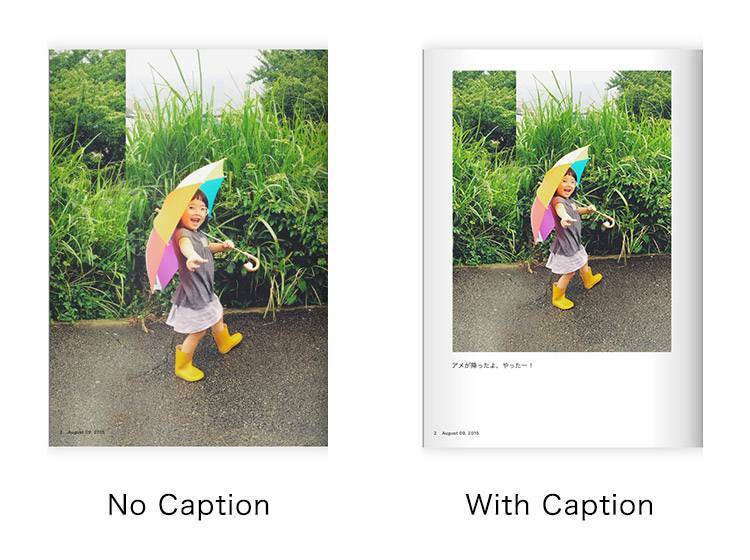 Tap and hold on a photo in the inside pages, then slide up and down to rearrange the pages in your Photobook. Can I make a Photobook for months further in the past? The Photobooks automatically created by FamilyAlbum only contain photos from the previous month. However, if you select the "Photobook" menu in the Memories tab, you can create Photobooks using whichever photos you like. We hope you have fun reliving past memories! Delivery of Photobooks in Japan will take around 7-10 business days via Japan Post's Yu-Mail service. In most cases, packages will be placed in mailboxes. Delivery outside of Japan will take around 2 to 3 weeks via international mail, depending on where the package is being shipped. Which company handles deliveries? Can I track my order? Photobooks will be sent via Japan Post's Yu-Mail service. Delivery outside of Japan follows the universal postal convention and will be delivered via a domestic delivery service. In both cases, packages will be placed directly in mailboxes and cannot be tracked. After I placed my order, why was I asked to register an email address and password? By registering your email address with us, you ensure that you can still recover your albums, even if you change phones or your phone breaks or gets lost, simply by logging in with your email address. This is why it's important to register. Can Photobooks be sent to an address outside of Japan? Yes, delivery is available to areas outside of Japan. Can I edit or delete delivery addresses? Yes. Select a photobook which you'd like to order from the Memories tab and tap on "Order this Photobook", then tap "Edit" beside the list of recipients. The changes I made while editing a Photobook have all been reversed! While you're editing a Photobook, the changes you make are stored in the cache of the device you're using. However, if you don't place the order and continue using the app, the cache can sometimes be erased and your changes may be lost. If you wish to save your changes midway through editing, tap the "Order this Photobook" option at the bottom of the screen. When you arrive at the next screen, your edits will be saved on the FamilyAlbum server. Rest assured this doesn't mean you placed an order, and you're free to go back and continue editing. Can I make changes to photos or comments after I place my order? We're very sorry, but because Photobooks are made to order, you can't make changes to photos or comments after placing an order. We ask for your understanding on this matter. We're very sorry, but because our Photobooks are made to order, we don't accept cancellations. We ask for your understanding on this matter. What should I do if I placed an order but entered an incorrect delivery address? Go to the Memories tab and tap "Order History" on the upper right corner. Tap on the order in question, and then select "Inquiries" at the bottom to inform us of the mistake. Please don't forget to tell us the correct address. We'll do everything we can to ensure your order is sent to the right address, but please be aware that if your order has already been dispatched, then there's nothing we can do. Why hasn't the Photobook I ordered arrived yet? Delivery of Photobooks in Japan will take around 7-10 business days. Delivery outside of Japan will take around 2-3 weeks, depending on where the package is being shipped. If the delivery period hasn't yet passed, please wait a little longer. You may also want to check that another family member hasn't already opened your package by mistake. My Photobook still hasn't arrived. What should I do? Delivery outside of Japan can take up to 3 weeks. If the period has passed, before contacting us, check that another family member hasn't already opened your package by mistake. Otherwise, go to the Memories tab and select "Order History" on the upper right corner. Next choose the order in question, and tap "Inquiries" at the bottom to contact us. Please tell us your name and the address to which the Photobook was supposed to be delivered. When my Photobook arrived, pages had fallen out/pages were out of order/it was dirty. What should I do? If you encounter such problems, please go to the Memories tab and tap "Order History." Select the order in question, and then tap "Inquiries" at the bottom to get in touch. If possible, please attach a photo of the problem with your inquiry. We'll send you a free replacement copy of your Photobook. When my Photobook arrived, the text had been printed incorrectly/the photos were damaged. What should I do? FamilyAlbum DVDs let you relive your family memories on your TV or PC. The TV Version DVD can hold videos you've uploaded to FamilyAlbum, which you can watch on your TV screen. The PC Version DVD can hold pictures and videos from the timespan you selected. For more info, go to the Memories tab and tap "Create" under DVD. Tell me more about the TV Version DVD. 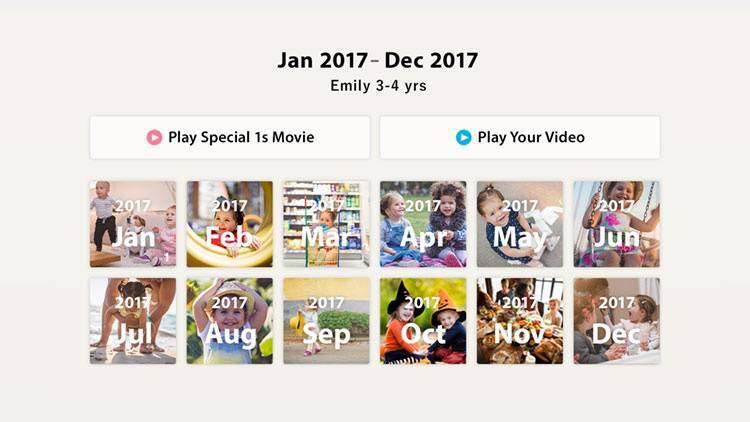 With the TV Version DVD, you can view your FamilyAlbum videos from a selected timespan on your TV. You can select up to a 13-month period. These videos will be used to create a Special 1s Movie. This DVD is priced at $34.99 USD (tax not included). The number of discs in your order depends on the amount of videos you select. Each additional disc costs $10.99 USD. The TV Version also has an auto-select feature. This allows you to automatically select and fit your data onto 1 disc. After auto-selection, you're free to select which of the videos you want to keep, so be sure to use this feature if you're not sure which videos you want to include. Tell me more about the PC Version DVD. 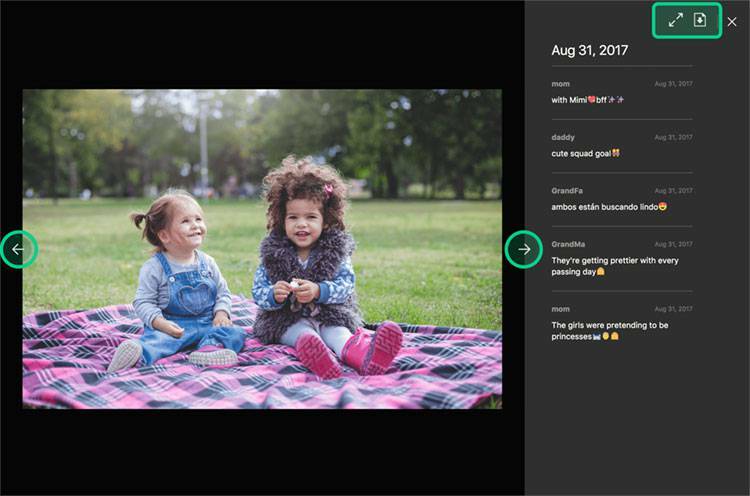 With the PC Version DVD, you can view your FamilyAlbum photos, videos, and comments from a selected timespan on your PC. The timespan you select can be as long as you want (for example, you can order a DVD containing only 1 month of data, or one containing 5 years of data). This DVD is priced at $34.99 USD (tax not included). The number of discs in your order depends on the amount of photos and videos you select. Each additional disc costs $10.99 USD. What is the Special 1s Movie? The Special 1s Movie is a digest compilation of your DVD. It's only available with the TV Version DVD. You won't know which videos will be used until you see it for yourself. It's a special surprise! How are the clips selected for the Special 1s Movie? Clips are selected automatically from the videos you put on your TV Version DVD. Please note that you cannot choose which clips to use. How do I use the TV Version DVD? Insert the disc into your DVD player and playback will begin automatically. Using the menu, you can watch the Special 1s movie or select videos by month. You can skip between videos using the Previous and Next buttons on your remote control. How do I use the PC Version DVD? You can view the pictures and videos on your DVD using a web browser. Any comments on the photos/videos will be viewable as well. Internet Explorer, Microsoft Edge, and Safari may not display the DVD properly. For the best viewing experience, please install and use Google Chrome. 1) Open "index.html" on your DVD. 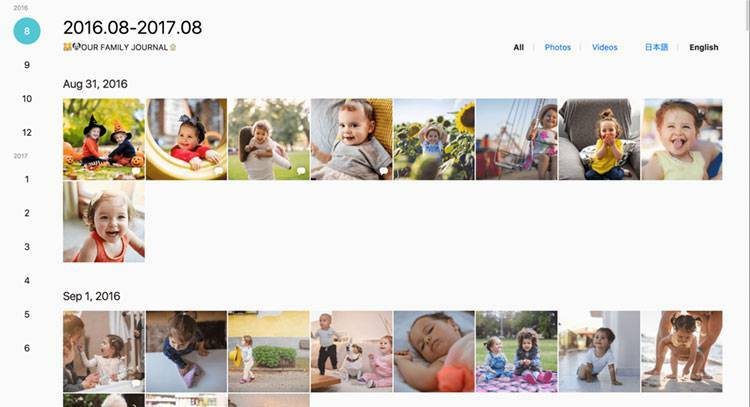 2) Your picture and video thumbnails will appear, sorted chronologically. Choose an item and click on it. 3) The details screen will be displayed. You can click the ← and → buttons or use your keyboard's arrow keys to cycle between items. Click "Enlarge" to enter fullscreen mode. Click "Download" to download a copy of the original file. 1) Open the "photo_video" folder on your DVD. 2) You will see folders named by year, like "2017" and "2016". Open the folder for the year containing the data you want. 3) You will see folders named by month, like "01" and "02". Open the folder for the month containing the data you want. 4) The files for that year and month will be displayed. 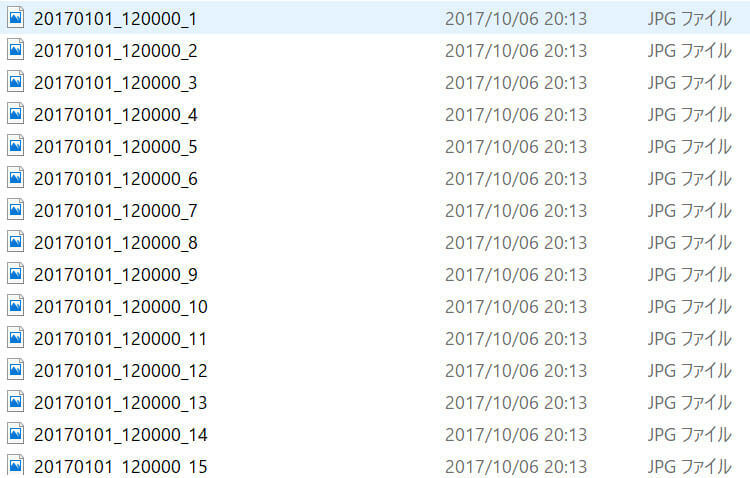 The files are named based on the date and time they were uploaded. Can I watch the TV Version DVD on my PC? You can watch the TV Version DVD on your PC if it has a DVD player. If it doesn't, use your TV's DVD player or install one in your PC. In some rare cases, DVDs that function correctly may still be incompatible with certain DVD drives. If so, please use another DVD drive or DVD player. Can I use the PC Version DVD on my TV? The PC Version DVD is only usable on your computer. What is the TV Version DVD's auto-select feature? The auto-select feature allows you to automatically select and fit your data onto 1 disc. After auto-selection, you're free to select which of the videos you want to keep, so be sure to use this feature if you're not sure which videos you want to include. Can I put pictures on the TV Version DVD? The TV Version DVD is for videos only. You cannot add pictures to it. Can I make a DVD with a small number of pictures and/or videos? Yes, you can. However, the Special 1s Movie will be shorter in length if there are fewer videos on the DVD. Can I save a DVD I'm creating and come back later? Yes, you can. Please note that your saved data will be deleted if you tap "Refresh Cache" in the app. Can I change the DVD's title? You can change the title to whatever you'd like. Titles of up to 25 characters (including emoji and special characters) can be used. Please note that if emojis and/or special characters are used, there may be instances where these characters cannot be printed due to font limitations despite displaying normally on your screen. In the preview screen, my photo for the DVD jacket barely fits in the frame. Will the jacket turn out OK? The jacket picture is cut into a square shape, and an additional 2-3mm are cut from the top and right sides during the manufacturing process. If you're unsure about your preview image, please try either changing or editing your picture and re-uploading it. Can I organize the photos and videos that will be on my DVD? Before placing a DVD order, you can edit dates and times from the album page. The photos and videos will then be sorted chronologically on the DVD. Is my DVD and/or order information shared with any other families? No, neither of these will be shared with other families. Both your DVD and order information are only viewable by you. I want to change the pictures, videos, and/or titles on my DVD after placing my order. You will first have to cancel your order by going to "Order History" in the upper right corner of the Memories tab. After cancelling, please submit a new order with your new data. Please note that as DVDs are made to order, they can only be canceled for up to 8 hours after an order has been placed. I want to cancel my order after I've placed it. Cancel your order by going to "Order History" in the upper right corner of the Memories tab. Please note that as DVDs are made to order, they can only be canceled for up to 8 hours after an order has been placed. After placing my order, I realized I entered the wrong shipping information. In the FamilyAlbum app, tap "Order History" in the upper right corner of the "Memories" tab. Select your order and contact support with the "Inquiries" button at the bottom. Be sure to include both the incorrect shipping address and the corrected one. Please note that depending on the timing of your message, we may be unable to change your information. Orders placed for delivery within Japan take around 7-10 days to arrive (excluding deliveries to islands far from Honshu), and are handled by Yamato Transport's Neko-Posu service (orders will typically be placed directly in your post box). International orders may take around 2-3 weeks to arrive, depending on destination, and are sent by international mail. Please note that separate orders may arrive on different days, even if both orders were made on the same day. Is delivery handled by a third party? Can I track the package? Delivery within Japan will be handled by Yamato Transport's Neko-Posu service (orders will typically be placed directly in your post box). Overseas deliveries will be sent by international mail. You will receive a confirmation email and tracking number once your order has shipped. Yes. Please note that international orders may take around 2-3 weeks to arrive, depending on destination. My order still hasn't arrived. DVD orders placed for delivery within Japan take around 7-10 days to arrive (excluding deliveries to islands far from Honshu). International orders may take around 2-3 weeks to arrive, depending on destination. We ask for your patience and to please wait until the estimated delivery time has passed. You can check the status of your delivery at the pages below using the tracking number from your shipment notification email. If the Yamato's tracking system says your delivery is complete but you haven't received it, make sure that a member of your family hasn't already received it for you. If your completed order is still missing, please contact Yamato Transport through the above page. If you haven't received a confirmation email within a week of placing your order, or if you have any other questions regarding your order, please contact our support service. You can do this by tapping "Order History" in the upper right corner of the "Memories" tab, select your order, and tapping the "Inquiries" button at the bottom. My DVD's jacket and/or the disc itself is damaged. In the FamilyAlbum app, tap "Order History" in the upper right corner of the "Memories" tab. Select your order and contact support with the "Inquiries" button at the bottom. Please include a photo of your damaged item(s). Any damaged or defective goods will be replaced free of charge. My DVD isn't playing correctly. · Ensure that the readable surface of your disc is undamaged, and clean it with a DVD or CD cleaning solution and cloth. · Try using your disc in other DVD players. If it plays correctly, there may be a compatibility issue between your other player and your disc. · Try playing other DVDs. If they don't play correctly, try cleaning your DVD player. If none of the above methods work, then your disc may be defective. In the FamilyAlbum app, tap "Order History" in the upper right corner of the "Memories" tab. Select your order and contact support with the "Inquiries" button at the bottom. Defective DVDs will be replaced free of charge. The text and/or picture on my DVD are garbled or distorted. Comments, photos, and videos uploaded via smartphone are stored as-is on the PC Version DVD. Your PC may be unable to display this data due to not having support for fonts, emojis, and/or certain photo and video files. If you need more information, contact support by tapping "Order History" in the upper right corner of the "Memories" tab, select your order, and tapping the "Inquiries" button at the bottom. Your DVD may have become unusable due to dirt and/or damage, or may have decayed from improper storage. Please protect your discs by storing them in a cool, dry place away from direct sunlight. Orders made in USD can be paid by credit card (VISA, MasterCard, American Express, Diners Club), while orders made in JPY can be paid by credit card (VISA, MasterCard, JCB, American Express, Diners Club), by carrier payment (Docomo, au, Softbank) or by convenience store. If you would like to pay for your order in JPY, please change your app's language to Japanese. If you're in Japan, you can choose to pay at a convenience store. You can pay at 7-Eleven, FamilyMart, Lawson, Ministop, Circle K Sunkus, or Seicomart. A handling fee of 108 Yen is required when purchasing photobooks with convenience store payment. DVDs have no handling fee with convenience store payment. Your order will ship as soon as payment has been confirmed. Please note that orders which have not been paid for by the payment due date will be automatically canceled. Please note that you can't cancel the order or change which store you will pay at after you've made your order. You'll need to provide a number when paying. You can find your numbers on the Order History screen. Go to the Memories tab, then tap "ORDER HISTORY" on the upper right corner of the screen. Payment methods vary by store. You can see how to pay at each store by tapping the links below. * The above links will transfer you to GMO PAYMENT GATEWAY (an external site/Japanese only). I saw that I was charged $1. Why is that? That's just an authorization check to confirm if your card is valid at time of purchase. Rest assured this $1 amount will not actually be charged to your account. Can I delete the credit card details I registered? Yes. First, go to the Settings tab and tap on "Inquiries" to get in touch with us. Just state in your message that you wish to delete your credit card details, and we'll take care of it as quickly as we can. Please note that our customers' credit card details are encrypted and carefully protected. 1s Movies are automatically created from one-second clips pulled from a selection of your memories. See your child's story told in a compact movie filled with laughter, tears, and beautiful smiles. The more you upload, the more effective your 1s Movies will be at highlighting your children's development. So what are you waiting for? Get uploading! When are 1s Movies distributed? Seasonal 1s Movies are distributed every three months. 1s Movies are distributed in the latter half of the month following each season (April, July, October, and January respectively). 1s Movies for April - June 2018 are distributed after mid-July. 1s Movies for July - September 2018 are distributed after mid-October. The schedule will continue as above every three months. Monthly 1s Movies are distributed every month to moms and dads who are subscribed to Premium. The 1s Movie for your registration month will be sent after the following month's distribution day (around the 10th of each month). First-time registrants will also receive a bonus 1s Movie made from photos and videos of the previous month. *Bonus 1s Movies will be sent after the distribution day of your registration month. Even if you've registered after the distribution day, rest assured that you will receive the bonus 1s Movie as soon as possible. *An album that has been registered under Premium before will not be able to receive the first-time bonus again in the future. *You will still receive Seasonal 1s Movies in addition to their Monthly 1s Movies while registered for Premium. If you register for FamilyAlbum Premium for the first time in March 2019, you will receive 1s Movies for both February 2019 (first-time bonus) and March 2019. You will receive Monthly 1s Movies as your subscription is renewed. I haven't received my 1s Movie. Seasonal and Monthly 1s Movies are only made if ten or more eligible photos or videos have been added to your album during the span of a season or month. Photos/Videos that have been taken in quick succession (such as consecutive shots), other 1s Movies, very short videos, and corrupt photos/videos are ineligible for use in 1s Movies. If you do not reach ten photos or videos by the time distribution starts, you can still reach ten photos or videos later. If you do so, a 1s Movie will be automatically distributed some time afterward. Will 1s Movies from 2017 and before be distributed? 1s Movies distributed after January - March 2018 follow the new 1s Movie distribution rules (updated late June). We are currently considering distribution of 1s Movies based on the new rules for memories before January 2018. How are 1s Movies made? We automatically compile your top-rated photos and videos of a season/month into a 1s Movie. Media is rated by visibility, facial and human recognition, and comment count. Then we try to select content that is evenly spaced throughout the month, take a clip from each, and string them together to create a single 1s Movie. All of this is done automatically by our special software. Can I add my 1s Movies to my album, or share them via mail and/or social media? 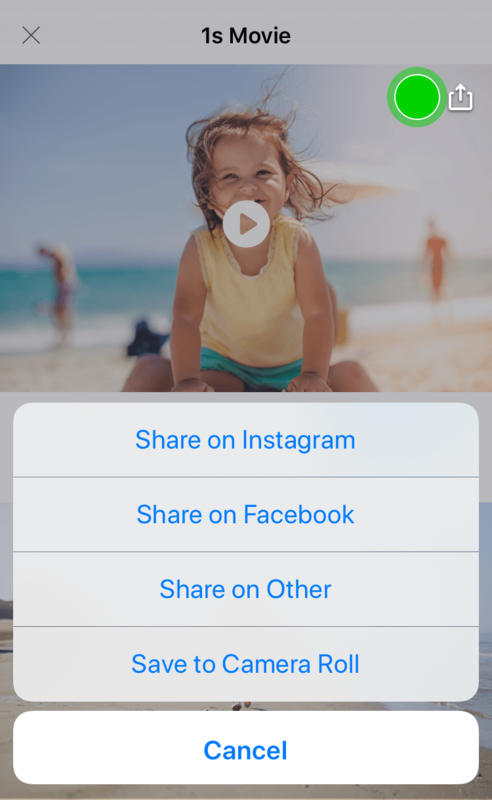 Use "Share in FamilyAlbum" to add a 1s Movie to your album. You can also save the 1s Movie or share on Instagram and Facebook via the upper right menu of a 1s Movie. Freely share the 1s Movie by any method, including mail and social media after you save it. Can I make my own 1s Movies, or edit previously made ones? Only automatically created 1s Movies are available right now. We are looking to add more variation on distribution timing, and choice when selecting clips in the future. 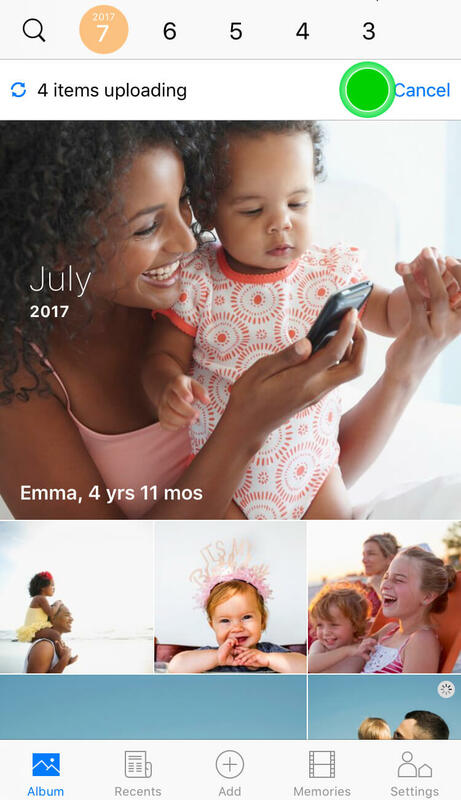 FamilyAlbum Premium is a service that grants all family members collaborating on the Premium Album special benefits for the low price of US$4.99 per month (in-app subscription). For more info about these benefits, please check the link below. *Price may differ by country and currency. *Only Mom and Dad can register for FamilyAlbum Premium. 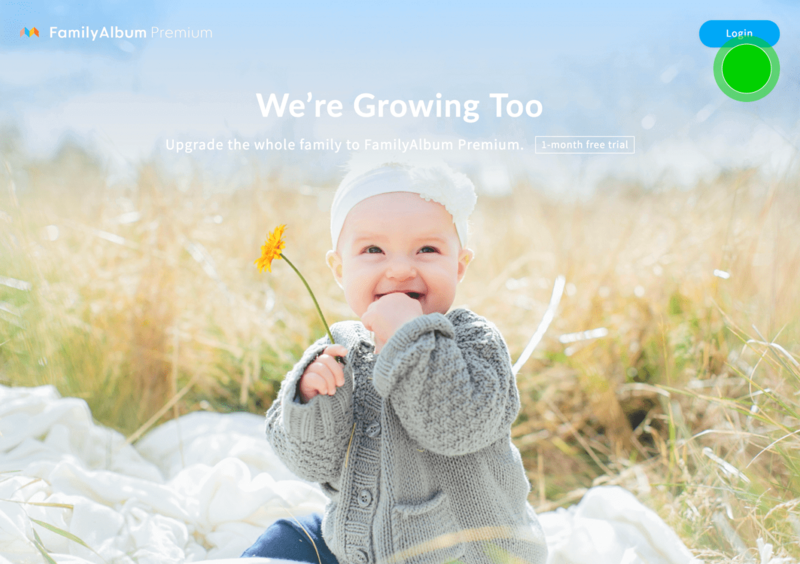 *Once Mom or Dad registers an album for Premium, all of its members can access Premium features. We offer one free month of service the first time you register for FamilyAlbum Premium. If you've already registered for Premium before on your account, you won't be able to receive this free trial again. Please bear in mind that if you choose not to cancel your subscription at least 24 hours before your free trial ends, your Premium subscription will automatically be renewed and you will be charged. How do I purchase Premium? 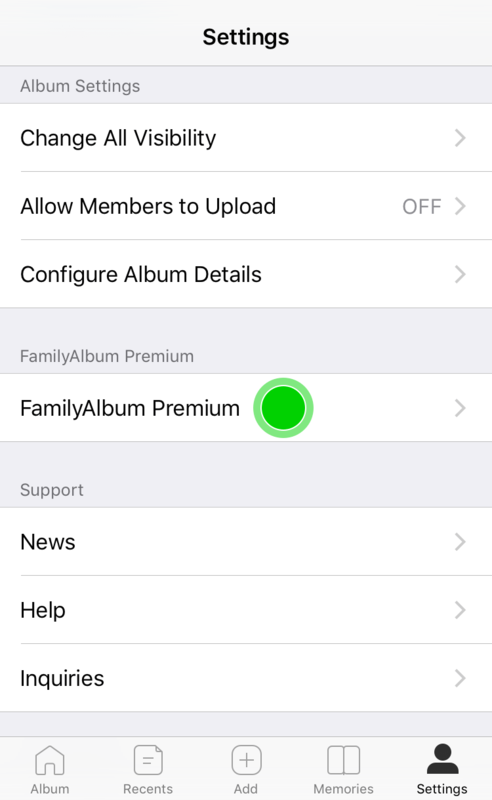 To purchase FamilyAlbum Premium, go to the Settings tab and select "FamilyAlbum Premium." Please follow the instructions on the page that appears to complete your purchase. Premium lasts for one month and automatically renews at the end of the billing cycle. Payments are made through the App Store and Google Play, so you can use credit cards, iTunes cards, or Google Play cards to pay. iTunes cards must be redeemed in the App Store, while Google Play cards must be redeemed in Google Play to be used. For more information, please check each platform's respective support page. Canceling stops your Premium subscription from automatically renewing at the end of the billing cycle. Once this billing cycle ends, you'll no longer be able to use Premium features. ・It may take a few days for your account page to correctly reflect your updated account status. ・You will still have access to Premium features until the current billing cycle ends. ・FamilyAlbum Premium is nonrefundable, including partial refunds. 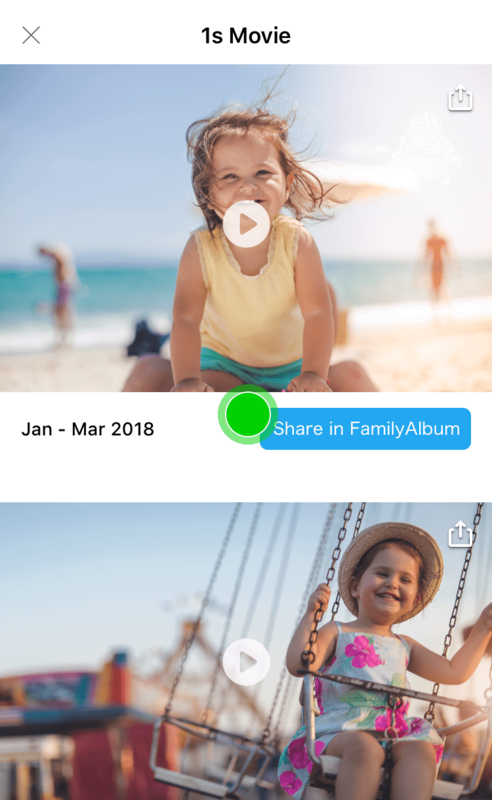 ・Even after canceling your FamilyAlbum Premium subscription, all photos, videos, and 1s Movies you've uploaded while on Premium will still be available for viewing. How do I check my subscription status, cancel, or change my plan? You can check or cancel your subscription by following the steps listed below. This will also give you information on the current billing cycle. *Uninstalling FamilyAlbum does not cancel your subscription. 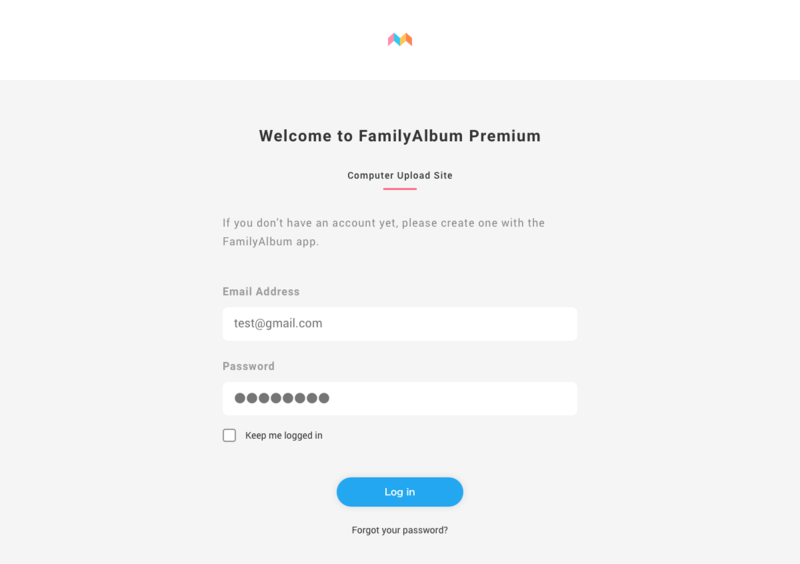 *Canceling your subscription to FamilyAlbum Premium will cause all family members in your Album to lose access to Premium features. When canceling a subscription, make sure to cancel at least 24 hours before the end of the current billing cycle to ensure you are not charged for another cycle. After the end of a billing cycle, your subscription will automatically be renewed within 24 hours. ・iOS 10 or Below - Open the App Store. Scroll to the bottom of the "Featured" Tab. Tap Apple ID. Tap View Apple ID in the pop-up window that appears. Enter your login info, then tap Register on the Account screen. For information on how to check or cancel your subscription on your computer, please check the page linked below. 1. Launch the Play Store. 2. Tap the Menu Icon "≡" and select Subscriptions. 3. To cancel your subscription, select FamilyAlbum Premium and tap Cancel Subscription. What if I change my device? When changing devices, log in on your new device with your account to carry over your user privileges. *If you haven't registered your account yet, please register by starting the app, going to Settings, and selecting Email under Login Settings. *Payments will continue to be made from the previously registered App Store / Google Play account. I want to make payments using a different store account. To change which App Store / Google Play account you make payments from, please follow the steps listed below. 1. Cancel your Album's current subscription through the App Store / Google Play. 2. Using the account you'd like to make payments from, re-subscribe to FamilyAlbum Premium within seven days of your subscription expiring. I've purchased Premium, but I can't use Premium features. 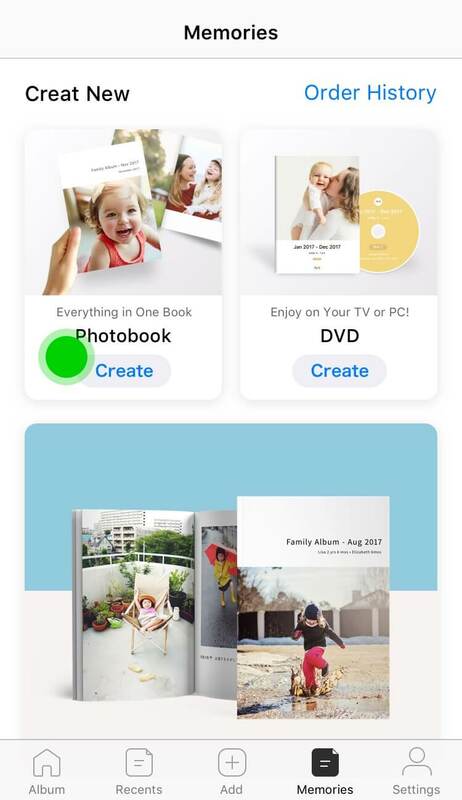 FamilyAlbum Premium gives all family members in an Album access to Premium features. The features for each relative vary depending on their relation to the parents (mother, father, grandma, grandpa, other family member, etc). If you have multiple Albums that you would like to use Premium features on, a Premium subscription must be purchased for each individual Album. If a mom or dad has already purchased a Premium subscription for an Album, you cannot purchase Premium for that Album until their subscription ends. * Even if they cancel their subscription, the Album will remain Premium for the remainder of the paid period. I've purchased Premium on multiple app stores. FamilyAlbum Premium services are nonrefundable, even if purchased on different app store accounts. We ask that you take care when managing multiple accounts. I've received a cancellation email. If your Album fails to automatically renew your Premium subscription due to your payment option expiring or your account having an insufficient balance, you may receive a service cancellation email from Apple or Google. Please contact the appropriate support team for questions and inquiries. How do I upload from my computer? With FamilyAlbum Premium, you'll gain the option to upload from your computer. (We recommend the latest version of Google Chrome.) Access the FamilyAlbum Premium page from your computer by going to https://family-album.com/premium and clicking the Login button on the top right of your screen. To allow grandparents and other relatives to upload, a parent should go to the Settings tab and turn on the Allow Members to Upload option. * If you haven't registered your account yet, please register by starting the app, going to Settings, and selecting Email under Login Settings. You can drag & drop or select files to upload. If you have multiple Premium Albums, you can switch between them by selecting the Album name on the upper half of the screen. There's a file I can't upload from my computer. We're always checking our error logs for failed uploads and do our best to add new usable file types as soon as possible. 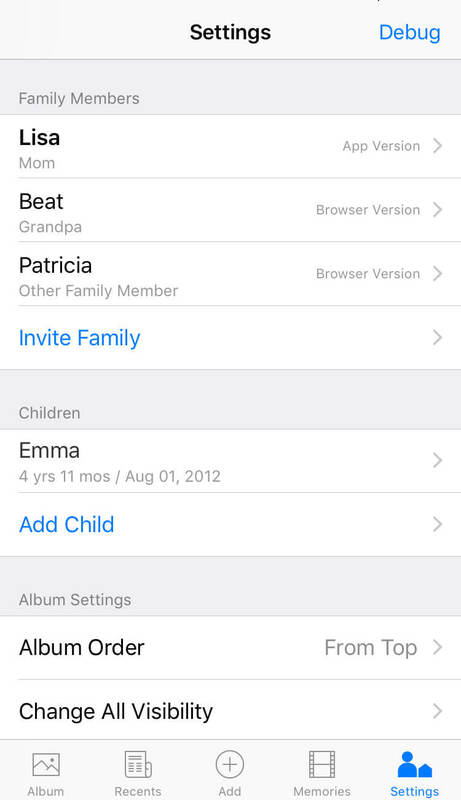 If you have a specific request, please contact us by going to the Settings tab in the FamilyAlbum app and tapping "Inquiries". Something called reCAPTCHA is displayed when I try to log in from my computer. What is that? We use reCAPTCHA's services for our computer login page. Using reCAPTCHA prevents unauthorized non-human access to your account. How do I make inquiries and report problems? 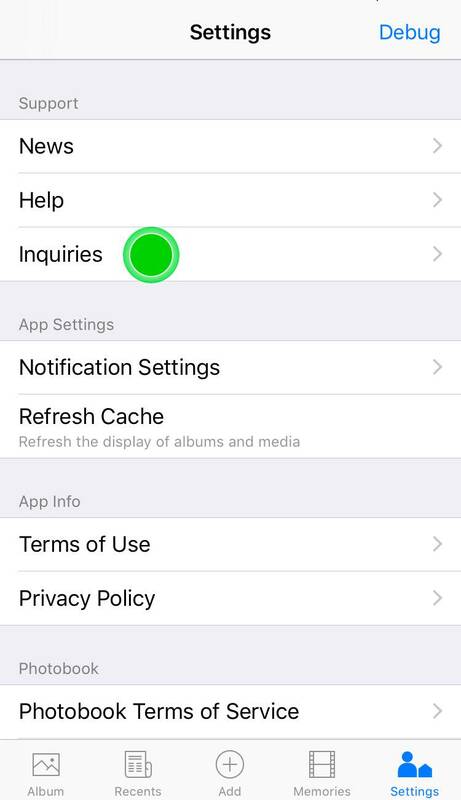 You can send us an email from within the app by going to the Settings tab and tapping "Inquiries." Or you can contact us at the following email address: support@family-album.com . We look forward to hearing your opinions and suggestions. What are the recommended system requirements for using the app? We recommend iOS 10.0 or higher. Those who don't yet have iOS 10.0 should go to Settings > General > Software Update on their iPhone, and update their OS. We recommend 4.4 or higher. We recommend the latest version of Chrome, or Internet Explorer. If you're experiencing problems viewing videos, we recommend using Chrome. We recommend always using the latest version of Safari or Chrome when using FamilyAlbum. If you don't meet the above requirements, you may be unable to use FamilyAlbum. Why did mixi begin this service? Our corporate mission is to provide fun and comfortable ways for people to connect. With this service, we want to help children and their parents to communicate better with their grandfathers, grandmothers, uncles, aunts, and other relatives, all in real-time through photos and videos. Our own development team contains moms and dads who want to make this a fun and easy-to-use service for themselves, too. We also operate the Nohana photobook service, which is designed specifically with families in mind. At mixi, we aim to deliver ever more family-oriented services that bring happiness and smiles to our customers.